I picked up My Name is Georgia by Jeanette Winter because I am planning (for about 3 weeks now!) to make a project based on Georgia O’Keeffe’s work. I really liked the book, because the biography of the painter was adapted really well for young readers, and illustrations are great. Smarty was very interested in both the story and the illustrations and keeps reading this book every day for the past two weeks or so. She still has no interest in an art project though. 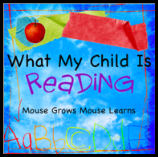 I’ve seen LMNO Peas by Keith Baker reviewed on several blogs, most recently on Children Grow, Children Explore, Children Learn. I wasn’t sure that my daughter will appreciate another alphabet book, but this is so much more than alphabet book. For once, the illustrations are very engaging. Also, the Peas try all kinds of jobs in this book which generated interesting discussions about more obscure jobs like investigators and electricians. A lot of big words for an alphabet book – highly recommended for ages 2-6! My personal favorite of the week made it to the list of Smarty's favorites too. Henri, Egg Artiste by Marcus Pfister (yes, Rainbow Fish creator) is quite brilliant. The only thing that both Smarty and I didn’t like is that Henri is cranky in the beginning of the story and is not very nice to his wife. However, the story takes off once he comes up with new inspiration for his eggs. I do believe that Henri looks more like a donkey than a rabbit, but I am willing to put up with it. I will not say more except that this story simply begs for an art project that didn’t happen yet… or yet again. You have some fun selections this week! I have to check out LMNO Peas. I think M would love it. On another note, the linky doesn't seem to be working right. I tried entering my link and the form showed up in the middle of your post. I put in my info and it says there's a link, but I don't see it. Odd. I am glad Anna enjoyed LMNO Peas. I know Selena really enjoyed it. My first thought was the same as yours, would she really enjoy another alphabet book. I also see the problem with linkz, there are two link points in the post. And it says "3 entries so far! ", but the links are not visible. I see problems with this service on other blogs, too. Too bad. Anyway, I'm glad Anna is still enjoying Jenny the cat. I participated this week, but I am having trouble getting the link icon to work. I am so glad that I learned about this project. It really makes me think about what we're reading each week. Sorry everyone - the link has been fixed now! We liked LMNO Peas too - it's a cute book. I'll have to check the library for the others! I am interested in the Georgia O'Keefe book...I'll need to try to find that one. That does look like a donkey instead of a rabbit. You convinced me to try LMNO peas though! I love how you give us your picks of the week, but then also put other good books in your widget. This week, I want to check out The Adventures of Polo and Daisy Dawson is On Her Way. Those look good too. I am encouraged by how you pick books that expand your daughter culturally through poems and art, too. My mom had a GIANT (and I mean giant) coffee table book of Georgia O'Keefe's paintings. I loved looking through those on Saturday afternoons, and to this day think it gave me an interest in her art. LMNOP's sounds good too. When my kids were little, I used to hum the tune Hush, Little Baby while rocking them to sleep sometimes. It is a very calming melody. I should look the actual poem up sometime so I can memorize the words. We read peas last year and even made some pea people. The kids thought it was fun! I've read the Baby's Bedtime Book to both my tots! And we just checked LMNO Peas out from the library this week. I'm looking forward to reading it with Jonathan this week. Thanks for leaving some book suggestions on my blog for my youngest! We do have a couple of the Progressive Phonics readers printed out, but I'll have to check out the Usbourne ones! I love it when a book begs for an art project! I saw Polo on this list. We just recently discovered him through our library because Angelina wants to read "comic books." Have you tried Owly? We have the entire Polo and Owly series this week. I'm behind on the book thread. We checked out the "Story Blanket" from a while back and loved it. Thanks!